One of the major reasons we moved to Finland was to slow down. To take time away from the crazy Bay Area (California) lifestyle and enjoy a more relaxed pace of living. In some ways it has been that, but other ways I feel we are becoming just as busy as before. It is good to keep oneself occupied with activities, but there is always the danger of burn out. The first year living abroad in Finland was a time for learning and discovery. Finding out new places, bus routes, getting around the cities, getting to know neighbors and school parents, learning the general system, rules, grocery stores, etc. You can make a case that the first year or so, you are still very much a tourist versus an expat. I think now after 1.5 years in Finland, we have plateaued or gotten over that initial hump and are fully engaged in our day to day activities and generally feel like this is home (for now at least). My son is now involved in karate, gymnastics and swimming classes every week while my daughter is keeping busy with sports that include swimming and soccer. She is also looking forward to badminton and other sports. My wife works full time and is also getting an LLM (advanced degree in law) at the same time. I have now been working for a Finnish technology start-up (Scoopshot.com) for nearly 1 year now. In addition to taxiing my children to all their after school activities, I engage myself in various outdoors activities such as cross country skiing, jogging and cycling. I am realizing it is very difficult to find spare time for social outlets, but I sometimes find some treasured moments for an occasional concert or a few beers with friends. These winter days, by the time the weekend arrives I am fully ready to just lay around and do absolutely nothing, until my inner fire to get active outdoors strikes again. 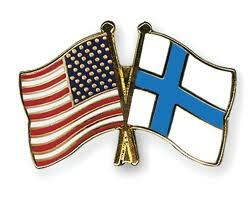 My hope is not to fall into the "rat race" in Finland that consumed our family in the United States. On the bright side, in Finland, when time off is taken, it is really enjoyed. I have mentioned this in previous posts, that generally when people take vacations in Finland, they take plenty of time to relax and do not check work unless it is critical. In the US, many jobs have pressure to always be available even if you are away on vacation. We are now deep into the middle of winter, but have turned the corner as the days are getting lighter and lighter. The worst of the long dark days are gone for now, but we will still have to deal with about 6 weeks of winter weather until the inevitable Spring thaw begins. Enjoy some recent pics I took during my morning walk to the bus stop. Finland is beautiful in the winter when the trees display their fresh white coats. Your kids seem to have a lot of activities by Finnish standards. You've already entered (them in) the rat race.